TENDE Elektronik Yazılım Mühendislik İletişim Makina San. ve Tic. Ltd. Şti. 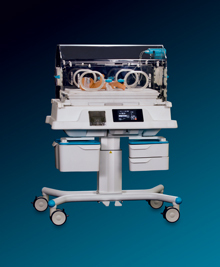 The Tende VAV Intensive Care Baby Incubator is one of the first infant incubators to incorporate Masimo Rainbow SET specialty measurements, including total hemoblogin (SpHb™) and oxygen content (SpOC™)—as well as carboxyhemoglobin (SpCO®), methemoglobin (SpMet®), and pleth variability index (PVI®). According to Ferhat YILDIZ - Tende CEO, “Masimo Rainbow SET measurements are an innovative and market disruptive technology, enabling us to supply our customers with state of the art technology that will provide caregivers the ability to more accurately measure a patients' oxygenation, even during challenging conditions of patient motion and low perfusion," Strong partnerships with leading medical companies, such as Masimo, as well as continuous cooperation with our customers is key – only then can you be sure to develop leading medical products, which effectively address customer needs – We believe this philosophy is what makes us successful”. Masimo Rainbow SET is the first and only technology platform capable of noninvasively and continuously measuring total hemoglobin (SpHb™) and oxygen content (SpOC™)—both measurements pending FDA and other regulatory clearances—as well as carboxyhemoglobin (SpCO®), methemoglobin (SpMet®), and pleth variability index (PVI®), in addition to oxyhemoglobin (SpO2), perfusion index (PI), and pulse rate (PR). Tende is a medical technology company manufacturing innovative products since 1997. Prior to 2012, Tende was an OEM electronic and software solutions Developer, and Manufacturer to many well-known medical companies. In 2012, Tende shifted focus to develop and market their own-branded products, establishing themselves, with more than 15 years of high tech experience, as an innovative Medical Equipment Technology Company Tende’s mission is to develop and manufacture high quality, products to world markets. For this reason, all products are designed and produced by highly skilled and experienced R&D Engineers to meet the highest quality standards.